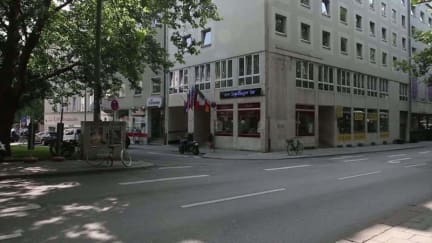 Hotel am Sendlinger Tor i München, Tyskland: Reservér nu! 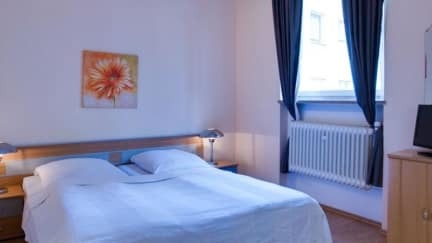 Hotel am Sendlinger Tor has one of the top-rated locations in Munich! Breakfast is available until 12:00 at Café Wörner, just 60 m from Hotel am Sendlinger Tor. Furthermore our hotel has twelve own parking spaces in the backyard and underground garage. We have a 24 hour reception and vending machines providing snacks and cold drinks. Our centrally located hotel is just a 1-minute walk from Munich’s Pedestrian Area, Old Town and Sendlinger Tor Underground Station. Karlsplatz Square and Marienplatz Square with the Old Town Hall are just a 10-minute walk from Sendlinger Tor. Munich Central Station and the Theresienwiesen Oktoberfest Venue are a 15-minute walk away. There are several restaurants and bars in the area as well. We offer modern rooms with flat-screen TVs and free Wi-Fi. Featuring a spacious layout, each room has radio and a private bathroom. Payment upon arrival by cash, credit cards (Visa, Master, Amex), debit cards/Maestro. At check-in we will charge your credit card automatically. Extras can be then paid with credit cards, debit cards or cash. Pet friendly. 10.00 EUR per pet/night. Parking: 15.00 EUR per parking space/night.